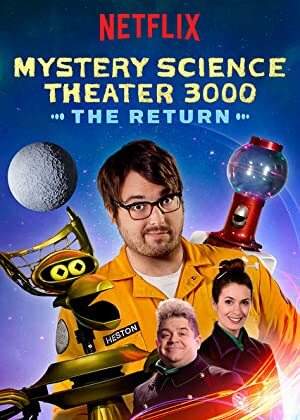 Mystery Science Theater 3000: The Gauntlet (2018) – What's New on Netflix Canada Today! This season, Kinga subjects Jonah and the bots to a devious new experiment: a back-to-back marathon of six hilariously cheesy — and riffworthy — films. Set in the not-too-distant future, a Gizmonic Institute employee is lured to the dark side of the moon by third-generation mad scientist Kinga Forrester and her flunky, Max. He is sat in front of cheesy movies with his robot buddies and forced to tortuously watch bad movies in their entirety as these mad scientists study the effects on his mind.